What did the Aztecs prize most? What happened to the Mexica gods after the Conquest? Just how were Aztec weapons used in practice? One of the Aztec treasures at the Philadelphia Museum of Art, the precious greenstone material underlines the importance of sacrifical altars such as this one in major Aztec ceremonies. Its top is engraved with the ‘4-Movement’ symbol for the present Aztec world era, surrounded by rays of the sun disc - a clear link to the giant Sunstone. Interestingly, the Registrar of the PMA recorded the collectors’ statement that the stone had been ‘[u]sed on the main altar in Mexico City and damaged by the Spaniards when rolled down the staircase’ (Aztecs, Royal Academy exhibition catalogue, p.455). 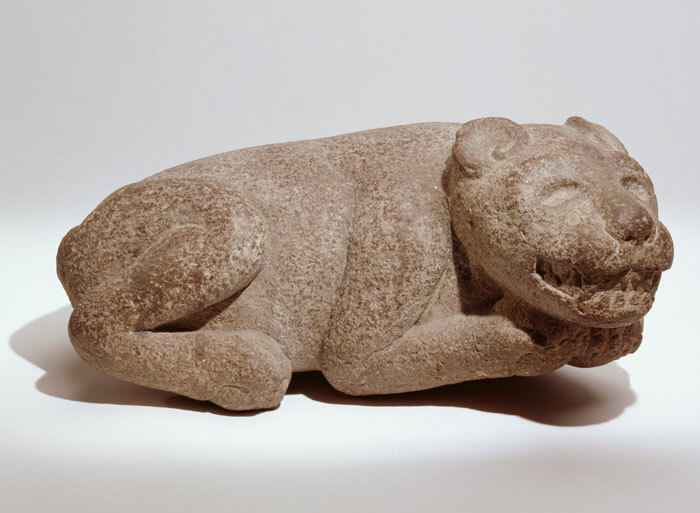 Other Aztec pieces at the PMA include... this beautiful reclining jaguar made of reddish volcanic rock - very similar to the one in the Royal Academy exhibition (which was loaned by Brooklyn Museum of Art). Both are excellent examples of the power of Aztec naturalistic sculpture. 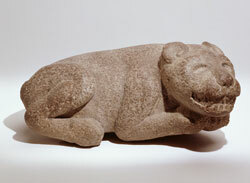 The jaguar was associated with power, courage, war, danger and darkness. It’s possible that this very sculpture ‘may have adorned a military academy at which jaguar warriors were trained’ (RA catalogue, p.417). 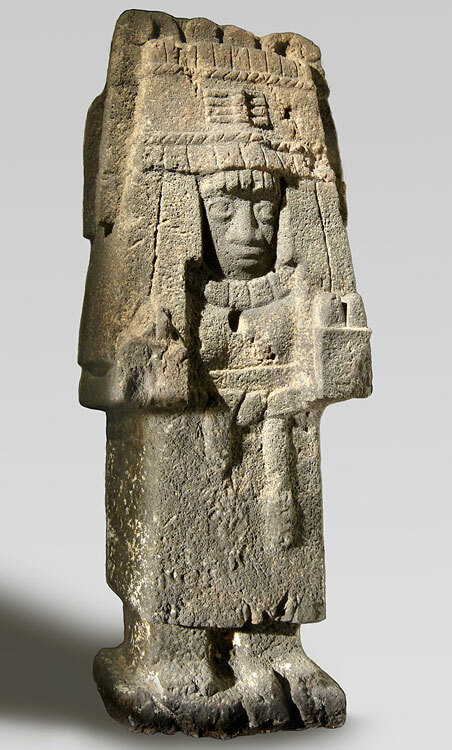 ... and this elegant stone sculpture of Chicomecóatl (‘7-Serpent’) - a fertility goddess responsible for maize (corn), so important to all the peoples of ancient Mesoamerica. 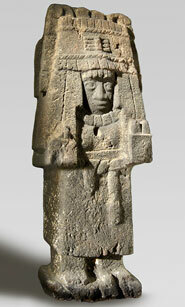 Again similar to the sculpture in the Royal Academy exhibition (loaned by the Berlin State Museum), though not as well preserved, she wears a square headdress and female tunic.